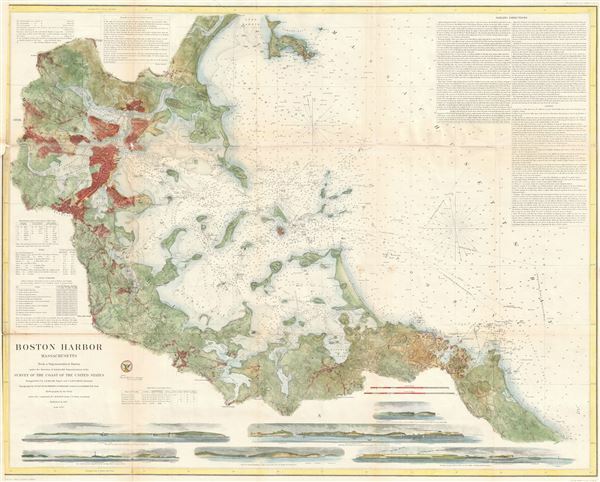 A stunning 1857 U.S. Coast Survey nautical chart or maritime map of Boston Bay, Boston Harbor, and environs. The map covers the Massachusetts coastline from Cape Ann southward past Gloucester, Marblehead, Lynn, Boston and Cohasset to Green Harbor River. It offers astounding inland detail noting individual buildings, roads, communities, fields, and smaller waterways. In addition to inland details, this chart contains a wealth of practical information for the mariner including six land profile views, countless depth soundings, sailing instructions, tidal information, lighthouse locations, and notes on magnetic variance. This chart is noteworthy in that it is one of the few that A. D. Bache took a personal hand in surveying. The triangulation for this chart was prepared by C. O. Boutelle and A. D. Bache. The topography was completed by H. L. Whiting, J. S. Williams, and S. A. Gilbert. The hydrography was accomplished by a team under the command of C. H. Davis. The entire production was supervised by A. D. Bache, Superintendent of the Survey of the Coast of the United States from 1843 to 1865. Very good condition. Some wear and toning on original fold lines. Backed with archival tissue for stability. Left margin extended. Rumsey 2615.000. Guthorn, P. J. United States Coastal Charts 1783 - 1861, p. 37.